Google's Project Fi today expanded the number of countries in which subscribers can roam. Project Fi was already available in 135 countries, and now subscribers can visit any of 170 countries and access their Project Fi service. Project Fi provides no-cost roaming, meaning customers are charged the same rates abroad as they are at home, including free texts, $0.20-per-minute calls, and $10-per-gigabyte data. 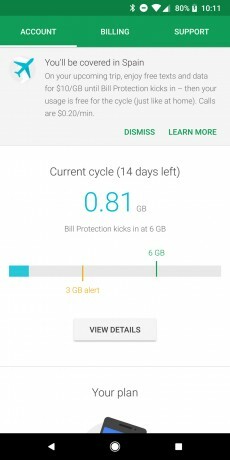 Project Fi will now also alert subscribers to roaming services available on upcoming trips. The service will scan users' email for flights and/or itineraries and let them know if they are covered in the destination country. Project Fi is Google's MVNO service. It is available to Pixel, Nexus and other select phones.